Mr & Mrs FoodPacker: "LIKE" Mr & Mrs Foodpacker facebook page!! Hey there readers! So guess what, yet again another stepping stone objective has been reached! Syukur Alhamdulillah.. without noticing this blog has been up and running for 3 months. 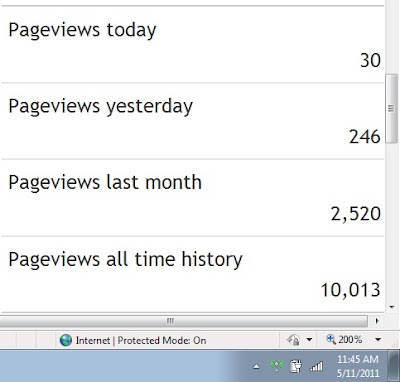 The reason for making this post is particularly to celebrate our 10,000 pageviews!!!! and as promised here, it is finally time to come up with our own official Mr & Mrs Foodpacker facebook page!!! The image is taken as of 5/11/2011 at 11.45am. Eventhough views last month have been running a little low due to my busy-ness (and also the fact that only ONE post was publish throughout the whole month haha) We were lucky enough to have reached our target by this month!!! So for that, i would like to thank all of you for your never ending support! P/S: Currently a pre-opening promotion is being held for all NCBL fans to commemorate the end of our 2011 basketball season. So if you'd like to view the videos of the best match of NCBL 2011- Phantoms vs J3, you are in luck! But if this does not interest you and you are more concerned over FOOD (purpose of this blog anyway) stay tuned for Mr & Mrs Foodpacker updates!! !